ZDoom • View topic - Police Brutality (Weasel Presents: Terrorists! ): Update! Police Brutality (Weasel Presents: Terrorists! ): Update! It's more than just a reskin of Nazis. 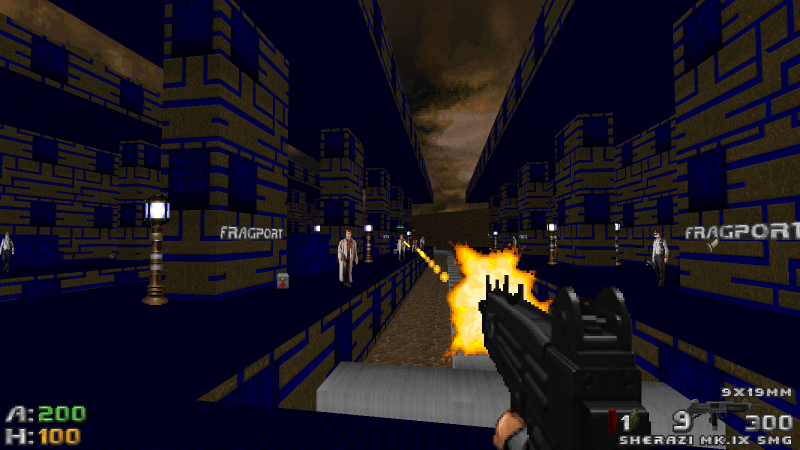 Really, apart from the bullet tracers, this is effectively designed from scratch, using borrowed TekWar enemy sprites to give the mod a sort of Lethal Enforcers/Operation Wolf 3 feel. Terrorists! is intended as a tribute to 1980's and 1990's action movies like Commando, Die Hard, Under Siege, Total Recall, and The Terminator. The focus here is on giving you all the tools you need to become your own Man of Action. This is a Hollywood-realism mod - weapons recoil and need to reload, but that's all! No complicated magazine systems, no bandaging, no weapon slot limits. 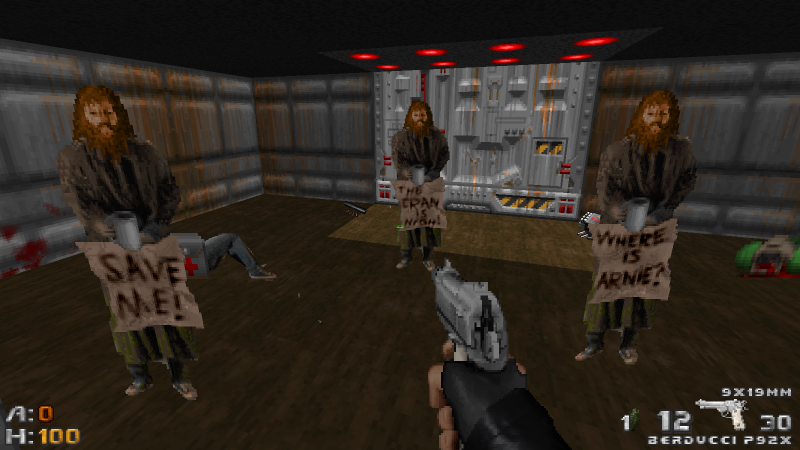 "Hostage System" replaces large powerups with civilian hostages that must be "rescued" with the Use key to obtain special items. Off-hand melee button with two modes: Kick and Taser. Aims to be cheesy...but *good* cheesy! And here's a spoiler fulla screenshots! Spoiler: Screenshots! Since you don't get anything else yet! The Aartsen Slugger shotgun shoots powerful 12 gauge shells at up to 200 rounds a minute in semi-automatic fire, but it does not eject shells automatically, so reloading may take a while. The Cooke GLP-140 is a revolutionary new method of delivering explosive ordinance up to distances of nearly 200 meters. Its 15 meter blast radius makes it great for dealing with crowds, but ammunition is rare. And some comments from the peanut gallery. And a spoiler fulla strategy guide stuff! Every weapon can be melee'd with using the alternate fire button. Some weapons have alternate modes that can be accessed by pressing Weapon Zoom. Currently this includes the AMR-82 and the Black Boar. Bind a Throw Grenade key and a Toggle Melee Mode key from the controls menu. The latter of these must be used if you want to try the taser. Press the Weapons/Ammo/Stats popup key (bindable in Controls) to see your collection of weapons and ammo on one screen. The AMR-82's damage does not change when zoomed or unzoomed. However, accuracy is (very slightly) reduced when unzoomed. Zooming also centers the point of origin for the bullet, so it is recommended when shooting through gaps to zoom in first. The Black Boar is much more controllable when steadied. Press Weapon Zoom to steady the weapon, at the expense of movement speed. Armor is extremely useful when up against foes like Dualie Dooley. Press USE to rescue hostages. They will drop useful items. And yet another spoiler fulla upgrade info! Berducci P92 -- Level 1: Fire rate increased. Level 2: Accuracy/muzzle velocity increased. 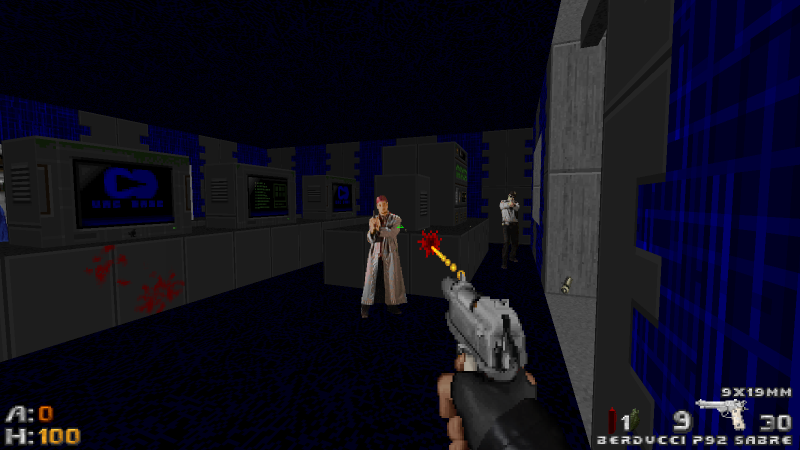 Level 3: Gun fires three-round bursts. Mariani Sulaco -- Level 1: Recoil reduced and fire rate increased. Level 2: Carbine kit reduces recoil/refire delay and boosts accuracy. Level 3: Zoom function enabled. Aartsen Slugger -- Level 1: Pellet spread tightened 50%. Level 2: Empty shells eject automatically. Level 3: Magazine detaches, skipping 90% of the reload sequence. Sherazi Mk.IX -- Level 1: Foregrip reduces recoil. Level 2: Fire rate increases by 0.5 tics. Level 3: Silencer makes firing undetectable and bullets more accurate. Kuznetzov 47M -- Level 1: Recoil reduced. Level 2: Bullets fly faster and more accurately. Level 3: Underslung grenade launcher, fire with Zoom button, press Zoom again to reload. Berlinghoff AMR82 -- Level 1: Recoil reduced. Level 2: Bullets fly faster and do more damage. 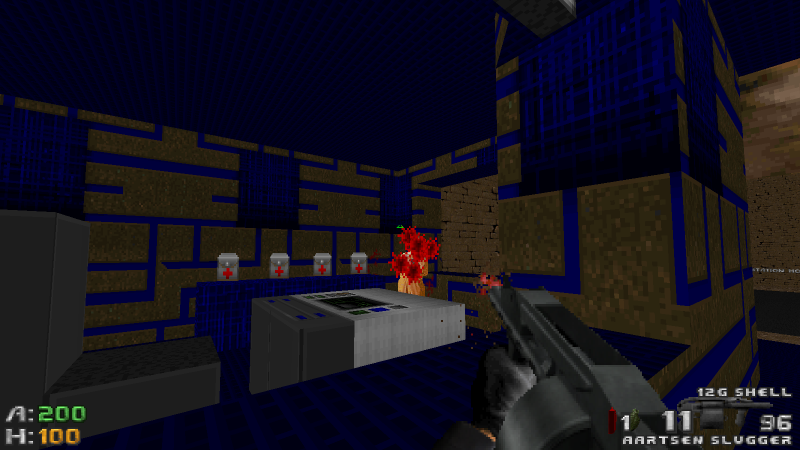 Level 3: Bullets explode when hitting walls. Cooke GLP-140 -- Level 1: Grenades fly faster and are no longer affected by gravity. Level 2: Grenades do more direct damage when striking targets. Level 3: Grenades' blast leaves small fires that deal continuous damage. Black Boar LMG -- Level 1: Movement speed no longer penalized when firing. Level 2: Recoil reduced while firing from the hip. Level 3: Bullets fly faster and do more damage. Kick Attack -- Level 1: Combo attack added. Level 2: Combo attack ends with repulsion shockwave. Level 3: Kicks explode on contact. Grenades -- Level 1: Frag grenades; stronger blast radius and "nail" effect. Level 2: Electric grenades which deal large radius damage and will stun enemies that are not killed by the blast. Level 3: Incendiary grenades with full splash damage and fire effect. Taser -- Level 1: Sets enemies on fire, does more damage. Level 2: Does yet more damage. Level 3: Chain-lightning effect (thanks Xaser!). Judging from the amount of views in the time-span this has been up, I would assume your experiment is going along rather well. In all seriousness, I look forward to this one. I hope you release it soon. Sounds promising, yet I don't think the sprites for the enemies match with the doom textures. Looks good, but I hope it won't be a mod that comes with too much ammo. I look forward to playing this. The concept is great. Hey WTF? I saw Brutal in the title and thought this was going to be something to do with Brutal Doom. I wouldn't have come here if I'd known it was just some other mod. Seriously, this looks interesting although I'm not sure how well the photo-captured sprites work against the drawn textures. However, I know the problems that there were tracking down suitable sprites so I guess its a "use what you can get" situation. As such, its perfectly acceptable IMO. Having mucked around with betas of this, I must say it's great fun. There's a new system in place with the enemies (that I won't spoil yet) that's simple but definitely works to make things more interesting. Where the hell did those weapon sprites come from? They're top-notch. 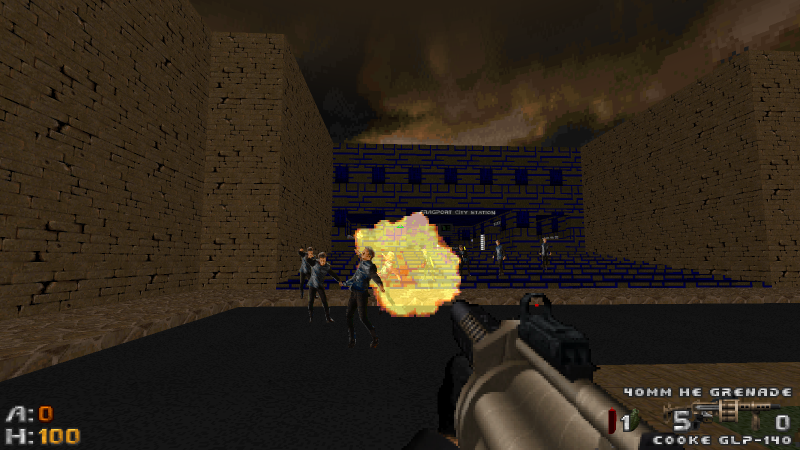 Mike12 did the pistol, the Uzi and AK were by Necronixxus, and I sourced the Slugger and grenade launcher from models on Gamebanana.com (full credit is given to the creators of those models in text files inside the mod, and will be included in plaintext when the mod is released). The leather jacket hands are by Midoriman and can be found in the hands thread in Resources. This looks awesome, I can't wait to try it out. Those are some excellent sprites. Location: Climbing up the Reichstag in a Spider-man costume. Location: Retrieval Officer Crimson pleased to make your acquaintance. hey, when you release this, may i have some of the weapons? 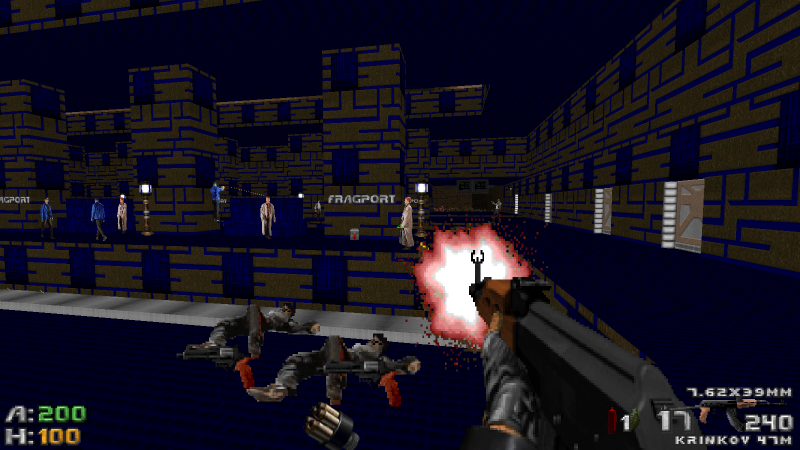 and is the reloading going to be cheap like NAZIS!, real reloading sprites, or no reload at all?